a). Necronom IV is the image which caught the eye Ridley Scott when he was handed a copy of Necronomicon and he knew which way to take the design of the Alien. We can see a general suggestion from his earlier work how this entity began to take form but this entity contained mysterious questions that needed answering. As I looked at Necronom IV and asked myself where the inspiration came from. It appeared to be part sea creature, part motorcycle and motorcyclist, part character from an ancient Egyptian mural and indeed the Dalinian phallus. After having discovered the various ideas and images from the Egyptian book of the dead in early 2011 that have inspired Giger's work for Alien so far, and also how Giger had turned Jean Delville's Treasures of Satan into an biomechanoid creature in Alien Monster IV. One thing to know about the alien in the movie, it could be said to often debrain and mummify it's victims before they begin their metamorphosis, somehow the idea of the creature we see sprung from the mysteries of ancient Egyptian mummification. I wondered perhaps if it was a Giger-ised animal headed god from the Egyptian pantheon but I couldn't find something specific in any of the well known images from that era. one version of the tool for "transnasal excerebration"
Perhaps this dried husk can be seen as a form of mummification and the cocooning of the human body is similar to wrapping it in bandages. Partial debraining is the first thing the creature does when it kills the characters Brett and Parker in the movie Alien. In Giger's sketches for Alien 3, the creature is found to go straight for the head area and then rip out the contents of the skull (see H.R. Giger's Film Design, p66-67, images 22 and 73). None of the actions of the aliens in other films in the series count in this case because Giger wasn't involved with the films although they continue to punch holes in the human's heads. 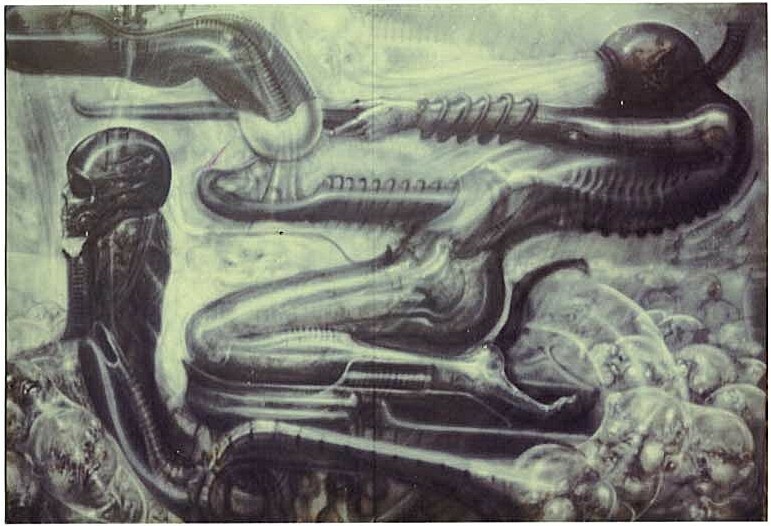 During the late evening of April 5th 2012, I took a look at an image of a little known Giger painting known as Work 286 which I had known about for the last couple of years , it was an image that preceded Necronom IV that was Work 303. The main figure with kneeling humanoid legs has the upper spine that sticks out of the back of the Necronom creature protruding from its stomach instead as if there is some form of a gaping maw and this spine has become a tongue, and the curved indentation of the tip of this structure is about to recieve an egg like form protruding from an ovipositor and in Necronom IV , this indentation is shaped to support the phallic end of the Necronom's elongated head. 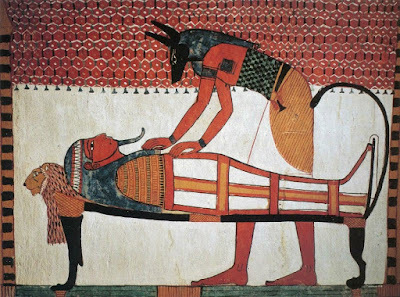 The tool held out by the outstretched arm of the figure in Work 286 reminded me of an oversized brain hook used by an Egyptian embalmer and so this lead me to look up Ancient Egyptian Embalming Ritual on the internet. 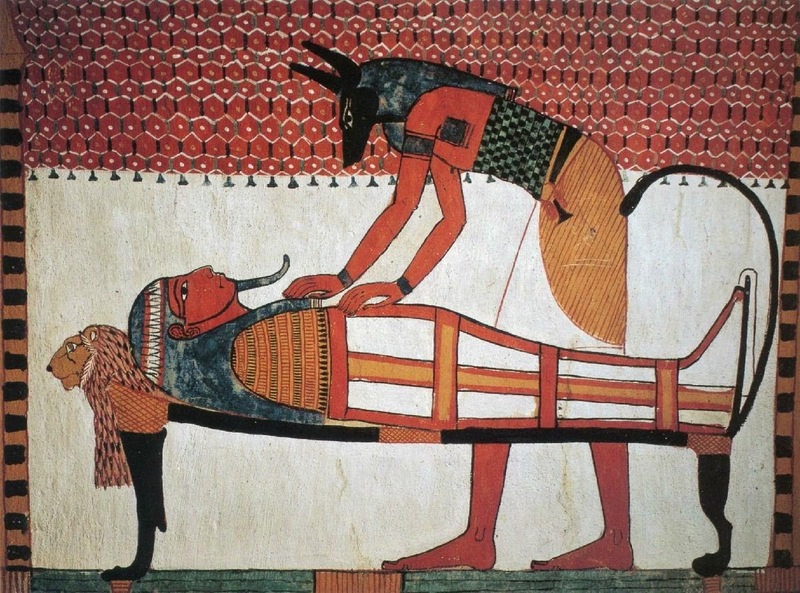 Searching for images of the Ancient Egyptian Embalming Ritual resulted in the discovery of images of the Anubis god embalming a human and this peculiar curved tail ending with a strange bulbous structure that contained a foetal skeleton. 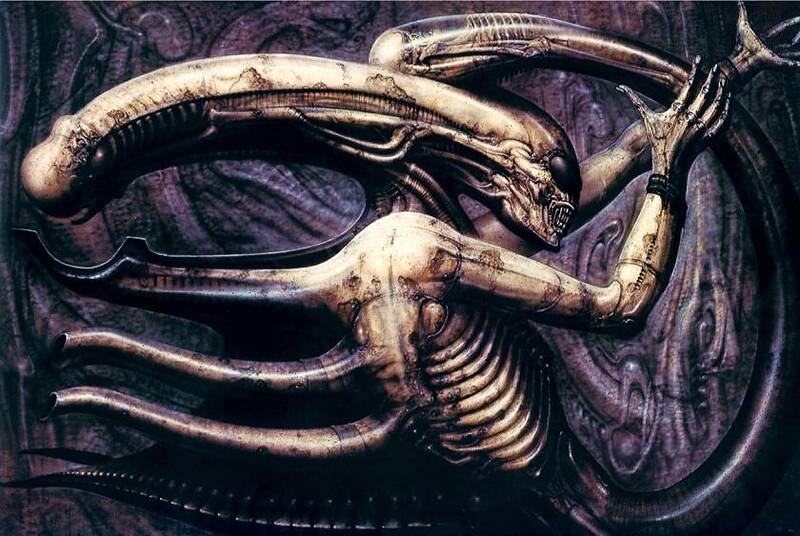 Ridley Scott referred to the tail of the final alien as an umbilicas and perhaps this tail was somehow a muscular umbilical cord with the small womb at the tip, but Giger had created a form which appeared to be a typical kind of bulbous topped tail on a lion embalming couch and "Gigerised" it. This also begs me to ask the question about whether the Necronom's face is a humanised lion from the embalming couch and perhaps this Necronom is a biomechanised impression of the form of the couch the mummy being embalmed and indeed the Anubis figure bending over the body but the way that Giger's creativity seems to play around with reinterpreting the forms in the image could raise so many questions that would go unanswered. 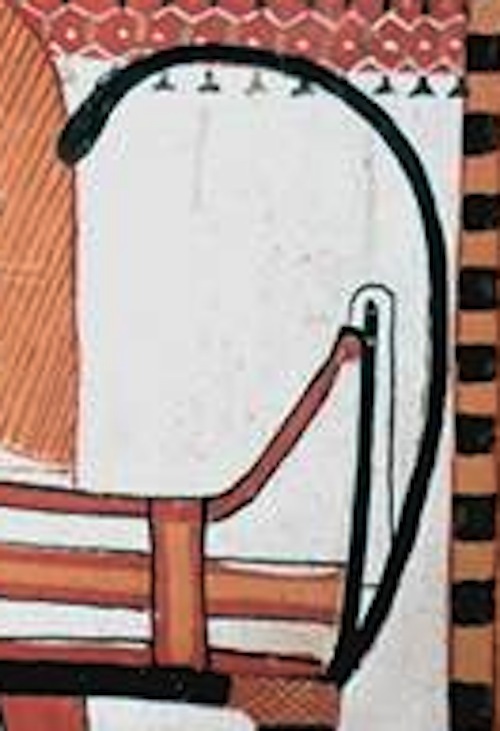 f) See: Other images of the lion couch.